An amazing Special deal on our 'Zensational' Acers - Whilst stocks last. 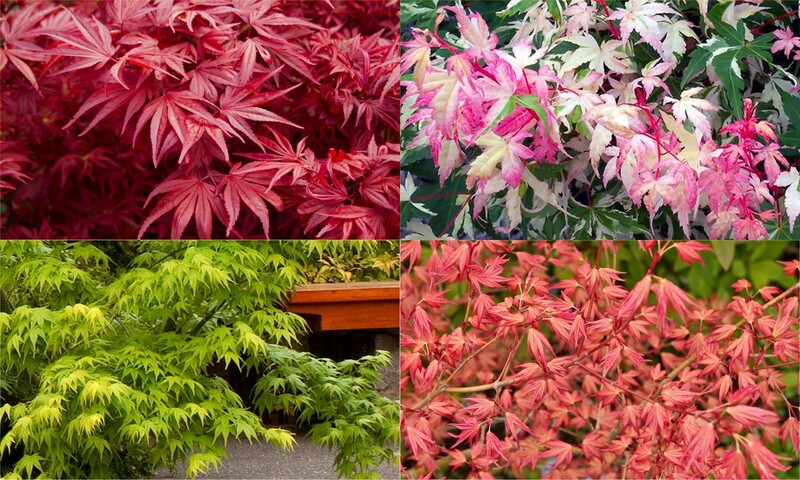 We are offering 4 fantastic varieties of these highly sought Japanese Maples, each in approx. 2-3 litre containers, lovely bushy plants at upto 60cms tall depending on variety and time of year, for just £79.95, thats under 19.99 each!! Aoyagi forms a striking upright specimen with beautiful pea-green branches in the winter months making it ideal to contrast with other plants for interest at the bleaker times of the year such as the Red-stemmed Acer Sando Kaku or Dogwoods. The foliage emerges as a nice bright green in spring, and remains so through out the year providing a wonderful foliage contrast to the other varieties in the collection. In autumn these leaves shade through fiery shades of orange and yellow. This Acer is a lovely compact variety with smaller leaves in the traditional Maple shape. It will give several seasons of interest in any garden, with the first foliage of Spring appearing as a peach-apricot shade, gradually transitioning to orange-red and then to bronze-green by late summer. In autumn as the temperatures fall, the leaves take on a bright scarlet-red colouration before dropping for winter. Momoiro Koyasan is an ideal variety for keeping in a container as a specimen plant, or position in a mixed shrub bed with in the garden, or next to a pond perhaps. Likely to emerge as one of the most popular Acer varieties but it is still very rare. The deep pink and white variegation in Spring is followed by pink, white and green foliage until leaf fall. Not only are the leaves attractively coloured, but the bark also carries variegation of creamy white and pink. New growth ranges from almost pure white to bright purplish-pink, all with irregular patches of green. Twigs on new growth are scarlet red. The Autumn colour is reddish-maroon. A slower growing form of red-leaved Japanese Maple, Shaina is suitable for small gardens or as a specimen in a large tub or container. In spring the leaves emerge as a bright scarlet-red, these then turn maroon-red in the summer months, and finally in autumn they transition to a bright and deeply coloured crimson. Ideal for creating a Japanese theme anywhere in your garden. Order today to take advantage of this great offer. If stocks of the varieties above run out we will send others selected from our vast range. Great in pots or containers, or planted in the ground mixed with other shrubs and acers. Remember, the bark of some Acer varieties has a nice winter glow, so they offer more than just foliage value in the garden. They are absolutely outstanding for autumnal colour. If you don't want a full collection yourself, why not share with friends? The plants will arrive with a total height of up to 60cms depending on variety and time of year and are perfect to keep on the patio in planters or plant around the garden and garden ponds. These plants give a wonderful effect in the garden what ever the season - as the name suggests, truly 'Zensational'!